Put the oatmeal and water into a heavy bottomed pot; bring to a boil, then add salt and chopped dates. Simmer and stir for approximately 20 minutes, adding the Lyle’s Golden Syrup when almost ready. While the oatmeal is cooking, prepare the sticky toffee sauce. Place the brown sugar, butter and cream in a small pot and stir until well blended and smooth. Simmer for a few minutes, then remove from heat and add the whisky, stirring well. 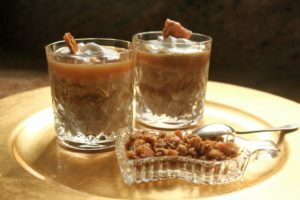 Spoon porridge into crystal glasses about one third full; sprinkle a few pieces of the brittle and pour on a little of the sticky toffee sauce; repeat with more porridge and sauce. Add a dollop of thick cream and decorate with a larger piece of brittle. Serve warm as a dessert.